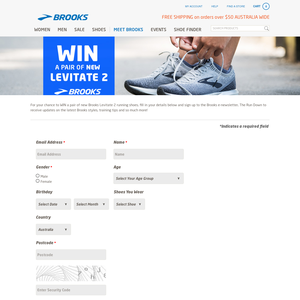 For your chance to WIN a pair of new Brooks Levitate 2 running shoes, fill in your details below and sign up to the Brooks e-newsletter, The Run Down to receive updates on the latest Brooks styles, training tips and so much more! Entry is open to Australian & New Zealand residents, except employees of Texas Peak Pty Ltd or Bocara Limited and their immediate families. The entire Promotional period commences on 6th August 2018 and closes on the 5th September 2018. The winner will be selected on 6th September 2018 at 9.00am AEST on the premises of Texas Peak, 30 Tullamarine Park Rd, Tullamarine, Vic, Australia. The winner will be notified by email. To enter participants must complete a competition entry form at https://www.brooksrunning.com.au/meet_brooks/competition/rh_competition during the dates specified above. It is the participant’s responsibility to ensure all details are full and correct before submitting their entry form. The winners of the Promotion will be chosen at random. The prizes must be claimed before 5pm AEST on the 7th October 2018 otherwise a redraw will occur. If in the event the prize is not claimed a redraw will occur on the 8th October 2018 at 12:00pm AEST at the premises of Texas Peak. The winner will be notified by email.